A Russian Soyuz rocket launches into space from Baikonur Cosmodrome in Kazakhstan on Sept. 2, 2015 to ferry three new crewmembers to the International Space Station. 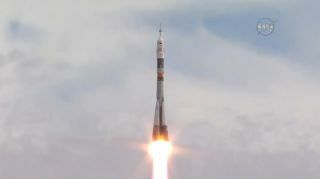 The Soyuz launched space travelers from Russia, Denmark and Kazakhstan during the flight. Three new crewmembers launched toward the International Space Station early Wednesday morning, embarking on a mission that will boost the orbiting lab's population to a level not seen in nearly two years. A Russian Soyuz spacecraft carrying cosmonaut Sergey Volkov, Andreas Mogensen from the European Space Agency and Kazakhstan's Aidyn Aimbetov blasted off atop a Soyuz rocket Wednesday (Sept. 2) from Baikonur Cosmodrome in Kazakhstan at 12:37 a.m. EDT (0437 GMT). It was 10:37 a.m. local time in Baikonur at launch time. You can see a video of the flawless Soyuz launch here. "We're doing great," Volkov radioed down to Mission Control in Russia after the successful liftoff. "Everything is in order on board." If all goes according to plan, the trio will reach the station on Friday morning (Sept. 4). The arrival will bring the number of crewmembers aboard the $100 billion orbiting complex to nine, a number last reached in November 2013, NASA officials said. But the abnormally dense population won't last long. Mogensen and Aimbetov will return to Earth on Sept. 12 along with cosmonaut Gennady Padalka, who has been living on the International Space Station (ISS) since March. After that departure, six crewmembers will remain — Volkov and fellow cosmonauts Oleg Kononenko and Mikhail Kornienko, Japanese spaceflyer Kimiya Yui and NASA astronauts Scott Kelly and Kjell Lindgren. European Space Agency astronaut Andreas Mogensen (top) gives a thumb's up sign as he launched into space aboard a Russian Soyuz TMA-18M spacecraft with cosmonaut Sergei Volkov (bottom) and Kazakh Space Agency cosmonaut Aidyn Aimbetov (out of frame) from Baikonur Cosmodrome, Kazakhstan on Sept. 2, 2015. The trio is headed for the International Space Station. Kelly and Kornienko are about halfway through the first-ever yearlong mission aboard the space station. Researchers are studying how they adapt physiologically and psychologically to long-duration spaceflight; the results should help pave the way for future human missions to Mars, NASA officials have said. Kelly's identical twin brother Mark, who is a former NASA astronaut, is participating in the experiment from the ground, serving as a control against which to compare the data gathered about Scott. Most crewmembers spend 5 to 6 months aboard the orbiting lab. Mogensen and Aimbetov are flying their brief 10-day mission because Soyuz spacecraft are certified to stay in space for just six months. So Kelly and Kornienko cannot return to Earth in the Soyuz that brought them up; instead, they will come down in the vehicle that is carrying Mogensen, Aimbetov and Volkov to the station. Aimbetov was a late addition to this "taxi flight." His seat was supposed to be filled by English singer Sarah Brightman, who was reportedly set to pay about $50 milllion for her orbital experience. But Brightman backed out in May, citing "personal family reasons."